No more rushing back to your desk to answer calls. The Plantronics APV-66 Electronic Hook Switch (EHS) cable enables wireless headset users to place or receive calls without the need to lift the handset of your Avaya 2420, 4610, 4610SW, 4620, 4620SW, 4621SW, 4622SW, 4625SW, 4630SW, 5420, 5610, 5620 and 5621 phones. 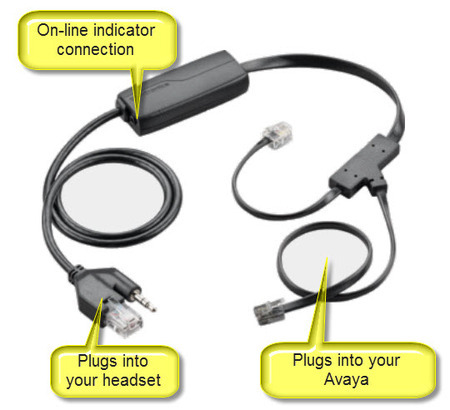 For other Avaya phones use the APV-63 EHS cable. Freedom to move away from your Avaya phone and answer calls from wherever you are, simply with a press of your wireless headset call control button. You can even use the optional Plantronics On-line Indicator, to let people know that you are busy on a call. The Plantronics APV-66 EHS only works with the following Plantronics wireless headsets: CS510, CS520, CS530, CS540, all Savi 700 series, Savi WO300 & Savi WO350. Use the APV-6B for earlier model headsets. Direct connection to your Avaya phone, which eliminates the need for a mechanical handset lifter device. Connect an (optional) On-line Indicator so that people know when you are on a call. This product supercedes the APV-65 Electronic Hook Switch.